Over the past 28 days, the governing Alberta NDP has been working to defend its record. The first major policy announcement made by Leader Rachel Notley was to expand the existing government incentive program to encourage energy diversification for projects like the propane-to-polypropylene complex being built near Fort Saskatchewan. “Our government helped create this and helped make that happen with a $200 million royalty credit,” Notley said during the announcement. Then came promises of 2,000 new long term care beds, increased drug coverage for seniors, expansion of the $25-a-day daycare program and a new highway in and out of Fort McMurray. “We know Fort McMurray needs a second route out and we will get it done,” Notley said in a Facebook live video. Over the course of the campaign, the NDP sent 128 emails to the media. Fifty-three were news advisories or announcements, while the other 75 were negative emails about the United Conservative Party. “Many of Mr. Kenney’s candidates have views that are demeaning to women, that are white supremacist. That are Islamaphobic and anti-LGBTQ,” said Notley. 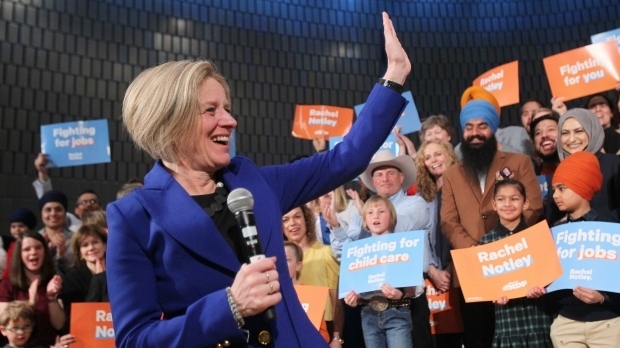 The NDP’s primary targets were controversies involving UCP candidates, allegations and investigations into cheating during the UCP leadership race and health care. The New Democrats are claiming the Conservatives health care plan would mean cuts to funding and the development of a two-tiered healthcare system. “We will not bring down wait times by creating two lines. One for the wealthy and the other for the rest of us,” Notley said. And in a rare move, the party hired a film crew to produce a 10-minute video on UCP Leader Jason Kenney’s past. In 1989, he lobbied against spousal rights for gay people in the United States, including hospital visitation during the aids crisis. The NDP held a screening for the video, shared it online, and called the one-sided, politically-motivated video a documentary. “A lot of people are saying that video crossed the line,” said Jared Wesley, a political scientist at the University of Alberta. “I think were voters have a problem is when they see the attacks being personal,” Wesley added. But the “attacks” were a big part of the NDP’s campaign. The party said it’s about showing voters what Jason Kenney has done and who he is. “Quite honestly, that goes to character. And that goes to the question of who’s fit to be Premier,” Notley said.